How do you make ropes? and the scripts are greate, but the rope doesn't interact with rigid bodies. Also I tried to use a skinned cylinder, but it also doesn't interact with rigid bodies. Deleted answer by Jake 2 due to reports of links gone bad and now containing viruses due to domain shifting. 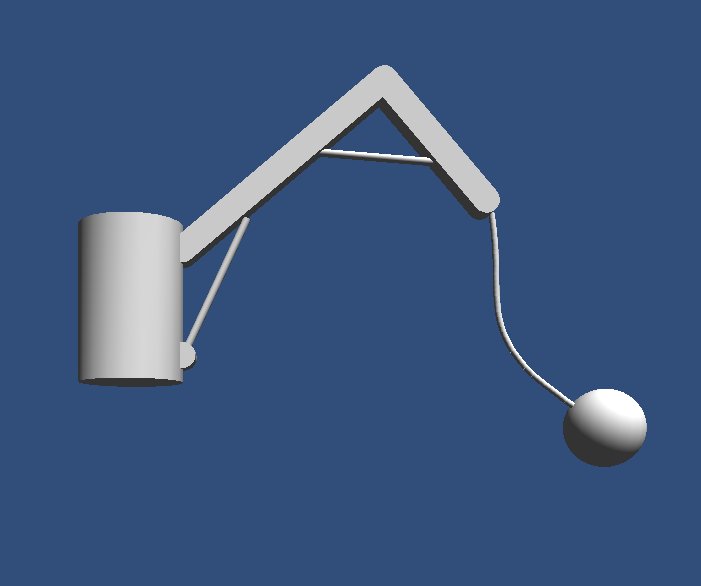 If you want to make a physics rope, it will take several segments of rigid bodies attached by Joints. Currently your best bet would be the HingeJoint. I recently worked on a Unity-powered game where we had a chain/rope-like string of objects that trailed behind the character and that was the class we used to tie those rigid bodies together. I'm going to be honest, this is a pretty intricate task and there isn't really an easy way to implement this - especially the winding/unwinding functionality. My personal advice is this - fake it as best you can. Unless the entire game is solely about the most realistic crane ever built, just fake it. Judging by the bottom-left image (stick man "platforming" on the crane) Correct me if I am wrong, but I'm guessing that you are making a platformer of sorts. When it comes to production you want to look at a cost-per-component ratio. You want the most important features, like your controls and other main game mechanics to have the most time/money invested. If something is rather minute in scope, insignificant in the grand scheme of things, investing so much time as to create absolute real-world physics is going to blow the cost/value of component ratio way out of proportion. It's really up to you to decide how important any component of the game is, but a rule of thumb I use is how often any one component appears in the game. If you've got 1-2 cranes in a level - not so important. Again, if the crane is the entire game, essentially, disregard what I said, use the HingeJoint class, and I will eat my hat. In the scenario where it should just be faked, I would do it using animations and coordinated/synced interpolated collision geometry to achieve a "good enough" product. Sorry for the length, hope this helps. Thanks, equalsequals! I'll try the hinge joint thing. I want rope to be as realistic as possible. Because the level consists of a platform and two cranes, so the cranes(and ropes) are important. But the top two green "wheels" + the rope between them, can be faked without ruining the actual game as I see it. Just make the "hinge joint" from the tip of the crane and down. Dont make the "roll around barrel" part with real simulation, just fake the look with animation or place the "wheel" inside a box so you can only see it going in through a hole. Wow! Very cool feature! But unfortunatly there is not unity3 yet, only beta for the ones who pre-ordered the product. I use indie version. Ya, I'm sorry. I've upgraded and have access to the beta. It's well worth the upgrade. You would be able to accomplish your idea much easier in 3 with a physics cloth cylinder, but with 2.6 equalsequals is right. PhysX (the buildt in physics engine) is useless for creating ropes/chains using RigidBodys and ConfigurableJoints if you are attaching anything "heavy" to the end. The reason is that PhysX only has an itherative solver. You need a direct solver for this. My tests so far is really promising! it's admirable you did work with ODE http://www.ode.org in Unity. it's an interesting observation that the usual ropes everyone uses in PhysX (just get any of the "ropes" kits from the asset store) are not suitable for a weight on the end. @buestad How did you integrate ODE exactly? It's not working how I tried it :/ Can you help me? I made this at work so I have a layer on top of ODE4j so my implementation is probably a bit different than a clean ODE4j implementation. But it shoud be possible without this layer. @LucaH007 if you use the original ODE written in c++ you'll have to add some information so that the C# code knows where to find the functions inside dll. I am no expert in c++, C# or dlls in general (by far), so therfore I went through IKVM which generates C# spesific dlls. I made a jar of a version of ODE4j which was on my drive. I think it is ode4j 0.12.0-j1.4, and compiled a dll with ikvm-8.1.5717.0. Then I included the dll, together with all dlls of IKVM (the x86 versions) and made a simple test project in Unity 5.2.2 x86. Not sure if you already got what you needed but I remember some time ago I was looking for the same thing and stumbled on this script which pretty much turns a line renderer into a rope. I don't remember how well it worked but in case you want to give it a try here's the link. This is helpful, but was confusing to get working at first (I didn't have objects far enough apart). Add this to get a menu item that adds an example to your scene. Then hit play, open Scene panel, and grab "start", and wiggle it! Has anyone got the c# version of this to work? I drop the script in, attach my target object, and the rope part seems to work--a segmented rope attaches between the anchor object and the target--but... the target object deforms as it moves, squeezing and stretching all over the place.